This is one of the easiest and fastest dishes to put together on this planet. It’s also one of the most delicious. H’s sister loves this meal so much I made it twice for her when she visited this past year and named it in her honor. The orange zest adds an unexpected pop of flavor that really wakes up the sauce. Steam broccoli for 4-5 minutes until fork tender. 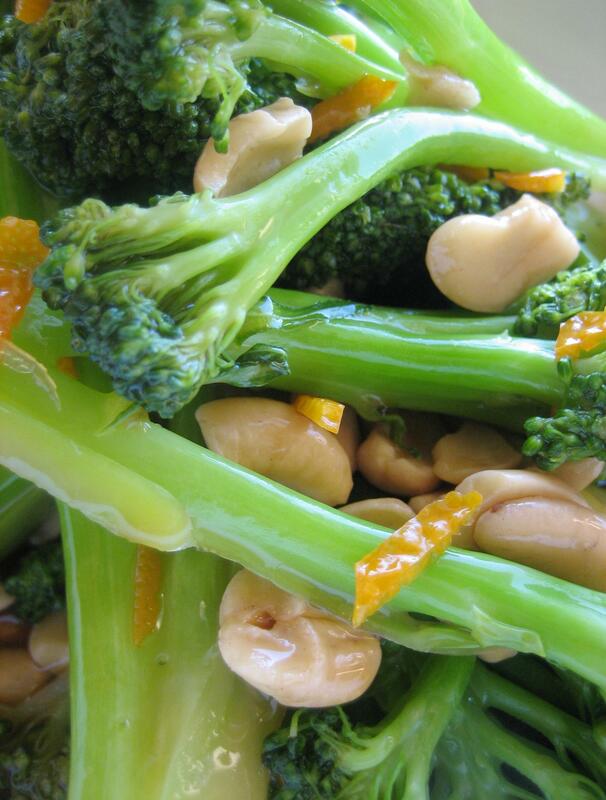 While the broccoli is steaming, add oyster sauce and vegetable broth to a boil in a large fry pan or wok-style pan. Add orange peel and cashews. If the sauce needs thickening, pour in the cornstarch a little bit at a time. Allow the sauce to thicken in between additions. [ You want it thick enough to coat the back of a spoon so that it will also coat the broccoli.] After the broccoli is fork tender and the sauce is the right thickness, add broccoli to the sauce and mix well. Serve over rice or noodles. Heh. It *is* really good. When she first arrived for her visit she was fearful that she’d starve with no meat in her meals. We soon allayed her fears and filled her tummy with tasty, healthy food. She even asked to be taken to the Asian store so she could buy a bamboo steamer to steam up broccoli at home. **whispers** You didn’t hear that from me, heh. Mmmm, my D makes a version of this, but I haven’t seen it on the dinner table in months and months. I am going to have to start dropping hints. *sage nod* I totally agree. It is really good, and quick!